You should indicate which of the ones below is the best answer to your question. While you leave that ambiguous people will keep trying to supply an answer that might satisfy you. Hi Arya, I have doubt. 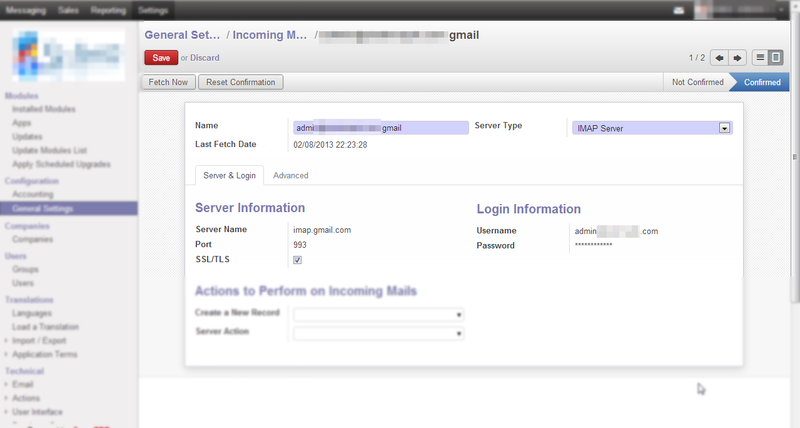 I am working on email configuration in openerp 7 with my client domain. I couldnt configure his domain with OpenERP. Entered his server name in Server Name field. If i Choose IMAP server as Server type should i add imap.mydomain.net? or use pop for pop.mydomain.net. Please mention ur comment whether i m right direction? Or Else any other procedure for do this one.. The answer above furnished is exactly true.But how can i configure email servers for different user with the different email id and passwords. For a [gmail] incoming port server, you can either choose IMAP (port 993) or POP (port 995) protocol - summarized here. From gmail help article, it seems IMAP is a more modern protocol, so I chose it. Supply your email address and password. I did not supply any other information to the Server Action Field or to the Advanced tab. Only OpenERP users that supply their email address and password to the Configuration can fetch the unread messages in their inbox and will appear in the Messaging Module. As I have read, OpenERP will fetch every 5 minutes but you can press Fetch Now to force the fetch. All emails that arrive on my inbox is from openerp@mycustomdomain.com. I also don't know how to change the "from" address. Maybe Fabien's suggestion of configuring a local server will make it work. The best approach is to use Local Server instead of POP or IMAP in the selection box. It gives you the script to use on your own email server. That way, all email aliases will work automatically. @fabien wow thanks for the tip I'll try a local mail server. It seems "a local mail server" is the only answer to this question: http://help.openerp.com/question/413/how-i-can-change-the-from-field-value-when-sending-a-message-because-it-always-has-the-same-email-address/ . Is my assumption correct? You can configure your mail gateway of any service provider, for example if you are using gmail then the configuration will like this, â¢Gmail SMTP server address: smtp.gmail.com â¢Gmail SMTP user name: Your full Gmail address (e.g. example@gmail.com) â¢Gmail SMTP password: Your Gmail password â¢Gmail SMTP port: 465 â¢Gmail SMTP TLS/SSL required: yes other mail options are also available. So finally I succeded in getting emails for a single email to a discussion group. Change the alias on the discussion group to test@test.com -In Actions to Perform on Incoming emails => Create new Record "Discussion group"
This worked for me. But I still do not understand why some messages are sent and others not. Question: I want the users to get additionally emails on all the notifications from their message inbox. I changed the preferences to "Incoming Emails and Discussions" but user do not get new messages?